Photoredox decarboxylative cross-coupling via iridium–nickel dual catalysis has emerged as a valuable method for C(sp2)–C(sp3) bond formation. Herein we describe the application of a segmented flow (“microslug”) reactor equipped with a newly designed photochemistry module for material-efficient reaction screening and optimization. Through the deployment of a self-optimizing algorithm, optimal flow conditions for the model reaction were rapidly developed, simultaneously accounting for the effects of continuous variables (temperature and time) and discrete variables (base and catalyst). 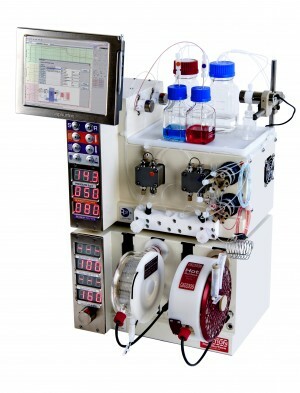 Temperature was found to be a critical parameter with regard to reaction rates and hence productivity in subsequent scale-up in flow. 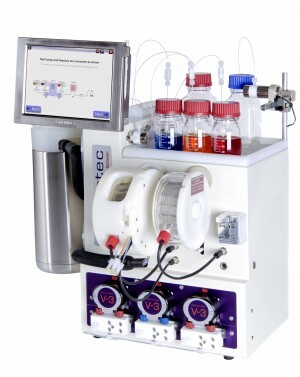 The optimized conditions identified at microscale were found to directly transfer to a Vapourtec UV-150 continuous flow photoreactor, enabling predictable scale-up operation at a scale of hundreds of milligrams per hour. This optimization approach was then expanded to other halide coupling partners that were low-yielding in batch reactions, highlighting the practical application of this optimization platform in the development of conditions for photochemical synthesis in continuous flow.